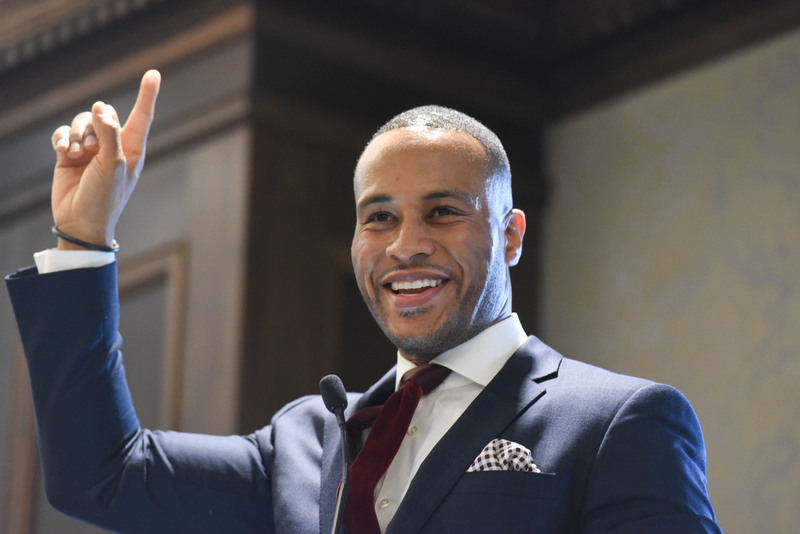 DeVon Franklin, award-winning film and TV producer, New York Times best-selling author, international speaker and spiritual success coach, kicked off Belmont University’s 2018 MLK Commemorative Week with a keynote address at the MLK Breakfast held on Friday, January 12. Lonnell Matthews, director of the Mayor’s Office of Neighborhoods and Community Engagement, attended the event and presented Franklin with a proclamation on behalf of Mayor Megan Barry before Dr. Jon Roebuck, executive director of Belmont’s Institute of Innovative Church-Based Leadership, opened the event in prayer. Black Student Association President and Belmont student Kayla Young then introduced Franklin and detailed his many accomplishments. Franklin described the initial days of his career — as an 18-year-old unpaid intern for Will Smith — and emphasized the importance of remaining committed to your beliefs, regardless of your environment. As a Hollywood employee, Franklin said many people doubted his ability to stay true to his commitments–including attending church on Sundays. But he was steadfast and sure to include his boundaries in initial conversations regarding his work. Not only were his needs respected, he even had the chance to begin Bible study conversations with his co-workers.